Visit the magnificent City of Chiang Rai on a half-day tour from Chiang Rai City. 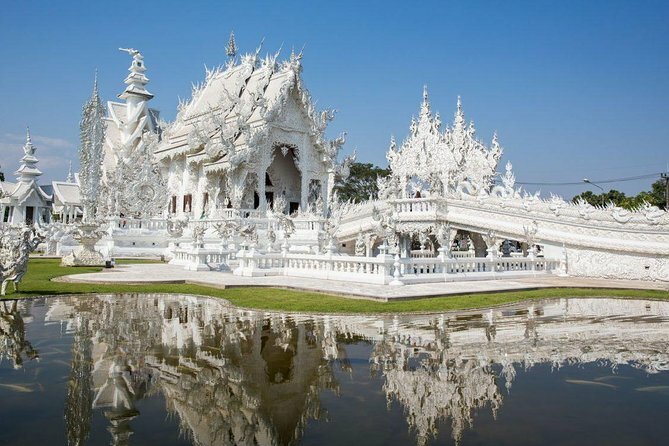 Enjoy the flexibility of a profesionall guide throughout the day as you visit the White Temple of Wat Rong Khun and Wat Pra Kaew, the most sacred Buddhist temple in Thailand, where the famed jade Buddha emerged after an earthquake.. This 4 hours tour from Chiang Rai includes pickup and drop-off at city hotels, entrance fees, and it’s a fun, personal way to explore the sites of northern Thailand. Explore the culture and heritage of Chiang Rai on this half-day tour. Visit the beautiful Wat Phra Kaew and Wat Rong Khun temples, monuments displaying intricate Thai architecture. Look through the bustling marketplace of Chiang Rai for local handicrafts and produce. Visit the main Chiang Rai market area for some exotic trinkets and foods before moving on to Wat Phra Kaew, the most sacred Buddhist temple in Thailand, where the famed jade Buddha emerged after an earthquake. Move on to the majestic Wat Rong Khun, or White Temple, to wrap up your journey. The ornate structure is lime sculpted with Thai designs and small mirrors on the outer wall, making the building sparkle under the sunlight. Don't miss snapping shots of the intricate murals as well as paintings on the enamel ceramic floor before heading home for a well-deserved rest.